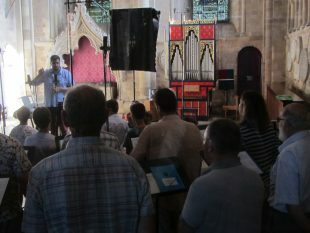 On Monday to Wednesday June 19th to the 21st the St Teilo organ has been taking part in a recording of late 16th century and early 17th century English church music at Romsey Abbey in Hampshire, where the organ has been living this past year. The organ has been used mainly for the verse anthems. The Abbey choir, with an authentic combination of boys’ and men’s voices, have been trained and are directed by the Abbey’s Director of Music, George Richford. It was sounding wonderful in the bloom of the Abbey’s acoustic.